We’re pleased to welcome our first snack of the month of 2019!​​​​​​​ ​​​​​​​Please welcome our January snack of the month — Raw Crunch! 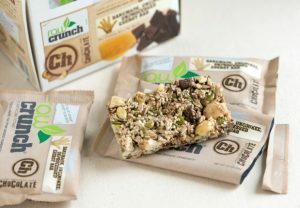 Raw Crunch bars are a great snack that are made in a unique way. They’re the brainchild of a couple whose passion for athletics led them searching for a quick and easy snack that would also maintain their blood sugar and offer the fuel they needed following workouts. The result was the creation of Raw Crunch bars. These bars are made from dehydrating the ingredients rather than cooking them, which offers a fun twist on a classic bar. They’re also handmade and prepared from organic ingredients with a variety of nuts, seeds and fruits. There are many flavors to choose from and we’ve got dark chocolate and blueberries with lemon to try in the office. If you like them, you can order online, or check our more of their yummy flavors. You can also check out their website and social media on Instagram and Facebook for updates on their products.